Last year, the Washington Association of Sheriffs and Police Chiefs (WASPC) rolled out the Venuetize Easy Alert app in Washington State. Now the organization is focused on training the 295 school districts in the state to use it to ensure emergency responders can react and respond quickly in an emergency – and to proactively put together plans ahead of an incident. You can learn more about Easy Alert and our DHS SAFETY Act certified security platform here. 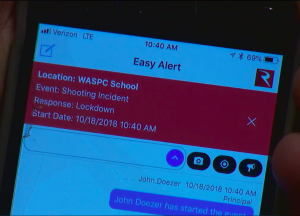 This week, KOMO-TV news ran a story on WASPC’s rollout of the Easy Alert app – and the training Washington educators are getting on the solution. You can check out the story, which details how Easy Alert is used, here. We are proud to work with more than 12,000 K-12 schools and other campuses across the country to help effectively prepare for, respond to, and recover from any emergency, and are thrilled to be a part of WASPC’s proactive program to roll Easy Alert out to all of the districts in the state.